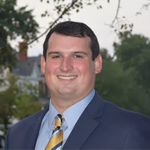 My name is Alex Girvan and I am a Realtor with Coldwell Banker Elite in Downtown Fredericksburg. I grew up in Fredericksburg and have a vast knowledge about the historic district, downtown and the surrounding counties. I earned an Economics degree from James Madison where I also had the privilege to be a quarterback on the Dukes football team. I worked for a Fredericksburg business that specialized in historic home renovation. Working in home renovation and real estate classes I took in college sparked my interest in pursuing a career in real estate. The Fredericksburg region offers a perfect blend of priceless historic properties with high quality, new construction. From a charming historic downtown filled with award-winning restaurants to family-friendly, planned communities with beautiful, wooded lots and countless, nearby amenities including a variety of shopping, recreation and dining options, Fredericksburg has it all. As a lifelong resident of the Fredericksburg area, my expertise of the regional real estate market and my excellent support team at Coldwell Banker Elite make me uniquely qualified to help you find the perfect home or sell your home quickly and for the best price. Buying or selling a home can be a stressful process, with many difficult decisions, but I will strive to make your experience as easy and stress-free as possible. I look forward to helping you find a home you will love or find a buyer to love yours.